This just in: Discovery Channel has chosen José Azevedo to wear the coveted race number “1” in the Tour. 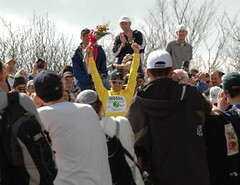 The number usually goes to the returning race champion, but with Lance Armstrong out of the picture, the team chose to assign it to Azevedo. Yaroslav Popovych was the most highly placed Discovery Channel rider other than Armstrong last year, in 12th. 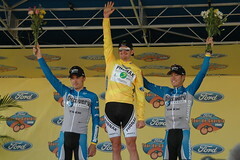 Azevedo finished 5th in the 2004 Tour. In case another rider complains, they can fall back on the kindergarten defense: Azevedo is the first Discovery Channel rider alphabetically. Discovery Channel named its Tour squad today. With Lance Armstrong out of the picture, Discovery has 4 different riders who could finish highly: George Hincapie, Yaroslav Popovych, Paolo Savoldelli, and Jose Azevedo. Their metamorphosis is going to be one of the big storylines of the 2006 Tour. There's a special announcement webisode available on the Team Discovery Channel webpage; I can't link it directly since the site is all-Flash. ThePaceline.com (free registration required) has the full press release. What next for Discovery Channel? What can Discovery Channel do to compete for another Tour title after Lance Armstrong leaves? Johan Bruyneel is the man who convinced Armstrong he could be a Tour winner. 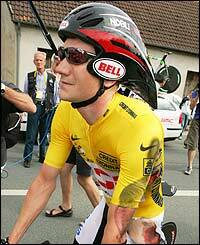 He's tipped Ivan Basso and Jan Ullrich as the most likely caandidates for the 2006 Tour. Discovery is believed to have recruited Basso, who signed an extension with CSC yesterday. 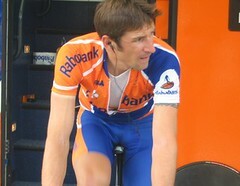 Bruyneel has previously identified Yaroslav Popovych, currently wearing the young rider's jersey, as the team's next great Tour hope. Now 25, Popovych won this year's Vuelta a Catalunya (the Tour of Catalonia), and was 5th in last year's Giro d'Italia; we'll likely see how long it takes him to develop into a grand tour winner. George Hincapie's stage win on Sunday had a few people suggesting that he could be a Tour leader for Discovery, but, well, he's 32, and I think it was intended more as a nice compliment for a rider who deserves tremendous respect than a serious indication of the team's direction. There have also been rumors of Alexandre Vinokourov joining the Discos. Certainly the Kazakh's powerful, aggressive style would make him a fan favorite, but could he master his emotions and ride a tactical race for three long weeks? Could be -- that's just the sort of description you would have gotten for Lance Armstrong pre-cancer. If anyone could convert him to a Tour winner, it would be Bruyneel, who's converted a similar rider to a 6- (maybe 7-)timer. Who will take Discovery Channel's next podium finish, if anyone? "To lose like that is like a punch in the guts," said Julich. "It's just fate-the yellow jersey can put pressure on you. I don't know exactly what happened, but it was just one of those things. "David's incredibly disappointed. He feels responsible for losing the jersey, but I've told him not to worry and that everything he's done up until now has been brilliant." CSC manager Bjarne Riis said Zabriskie is "in a lot of pain, but I don't know how bad he's hurt. We'll see that later." "We know Tom Boonen - and I think he can win six or seven stages in the race - that would be good for us. He could give us a help there." 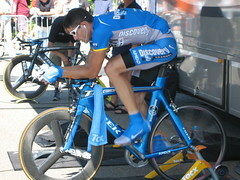 Discovery dedicated the win to Viatcheslav Ekimov, one of the team's strongest time trialers, who was scratched from the team's plan after a bad training crash in April. Armstrong said the team rode in the same order as last year, with Popovych taking Ekimov's place, and Paolo Savoldelli replacing Floyd Landis. For his efforts, Popovych bumps Fabian Cancellara out of the white jersey for best rider under 25. Armstrong was more forthcoming, suggesting that, with Discovery Channel now occupying four of the top six places on GC courtesy of Hincapie, José Luis Rubiera and Popovych, the yellow jersey might leave his shoulders but not his team’s custody over the coming days. That means the team may let Hincapie take a flyer one day, so he would have a shot at spending the day in yellow after all these years shepherding the yellow jersey. 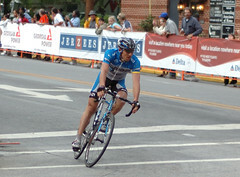 Armstrong at Tour de Georgia. "I think we have fielded our strongest team ever with this formation," said Armstrong. "It has many consistent elements from years past, like the Spanish armada for the climbs, strong guys like George, Pavel and Benjamin, the Giro winner in Savoldelli plus a guy like Popo (Popovych) with a very bright future." Armstrong regrets the absence of ageless wonder Viatcheslav Ekimov, injured training near Austin in April, but says he "plan[s] on riding the race with all the toughness he (Eki) has shown over the years." Eurosport quotes an article in le Parisien (premium content) that Discovery Channel is looking to sign T-Mobile's Alexandre Vinokourov, winner of Thursday's stage to the top of Mont Ventoux at the Dauphiné Libéré. "There exists a list of riders, but we can't tell you if Vino is on it or not," Armstrong's agent Bill Stapleton told the paper. "Ask Johan," quipped a coy Armstrong sending the newspaper's reporter to see team manager Johan Bruyneel who in Sphinx-like fashion replied "every great rider at the end of his contract interests us." Vino himself says he won't make a decision until after the Tour. No mention of the Vinokourov speculation. 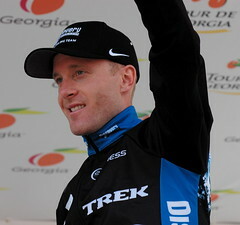 Vinokourov shooting for Tour win, but when? "I've maybe still got two or three years left in the peloton but in that time I'll be basing everything on winning the Tour," said Vinokourov, also a two-time winner of Paris-Nice. "I've won other races, but now the Tour's the only thing I'm really interested in." The knock on T-Mobile has always been that, like the New York Yankees, they have too many prima donnas to work together as a team, and you've got to think this may not be the unquestioning declaration of team loyalty Jan Ullrich is looking for with the 2005 Tour de France less than a month away. Ullrich was 2nd at Sunday's GP Aargau, and is headed for the Tour de Suisse, starting Saturday. The Kazakh says he's ready to ride for Ullrich -- if Ullrich shows up ready to win. If not, he hopes the virtual favor will be returned. There is also the factor of their other teammate Andreas Klöden, who finished second on the Tour last year, but is said to be chasing his form after a mediocre start to the season. "The race will decide what happens," added Vinokourov. "But the most important thing for us is that one of us wins. To come second, third or fourth will not be considered a good result for T-Mobile. It's Armstrong's final season (race), and we'll do everything we can to beat him. If he turns out to be unbeatable again, hats off to him. But we'll see whose wearing the jersey into Paris." At the Dauphiné Libéré today, Vinokourov spent about 20 minutes in an all-star breakaway with Yaroslav Popovych and Jose Azevedo of Discovery: three guys who could contend in the Tour after Lance Armstrong retires.